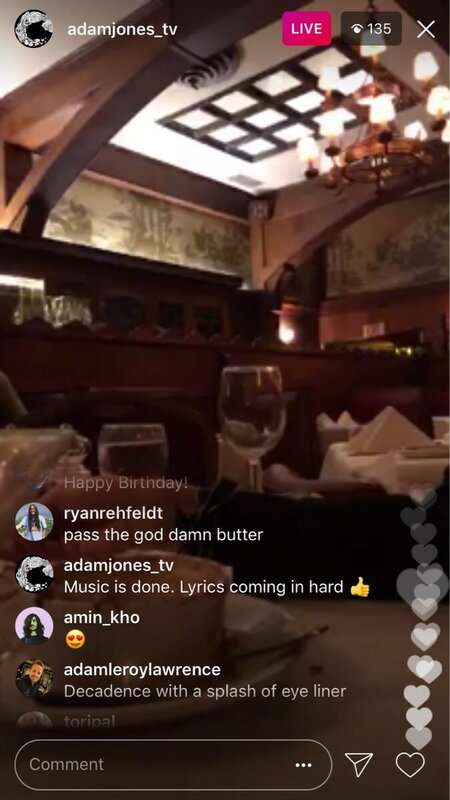 Adam undertook some more Instagram live streaming yesterday, and while it wasn’t some live cuts from the Loft, it did include a comment that the “Music is done. Lyrics are coming in hard“. Great news that the new Tool album seems to be on the home stretch. Music is done. Lyrics coming in hard. OD – Danny, where are we with the new Tool album? Can you give us an update? DANNY – It’s all coming together really well. We’ll be hitting the studio again very soon and have a couple of gigs in May (Coachella Festival), so hopefully, we’ll have the album out before that. It’s wishful thinking at this point. I actually think I said that this time last year (laughing). OD– Do you have a lot of material for the album? DANNY – Yes, there’s a lot of material that’s already done so, we’re looking to go into the studio pretty quickly here and off we go! Things are just rollin’ along. We don’t just hang about here in Hollywood, we are pretty much working all the time. There’s a couple of interesting things in that statement. Great news that it appears they might hit the studio soon. The suggestion of Coachella and a May release seem odd ones. I suspect Coachella is a mistake and was added by the author rather than Danny (A Perfect Circle are playing Coachella) and a May release date seems outrageously optimistic for an album not yet recorded. May 2019 for both perhaps! Things are moving so slowly in Tool land at the moment, I’ve run out of material (and motivation) for regular posts. So while Tool are in stealth mode (likely for the rest of the year I expect) rather than bombarding you with with stuff that is only somewhat interesting, I’ll do a weekly update. 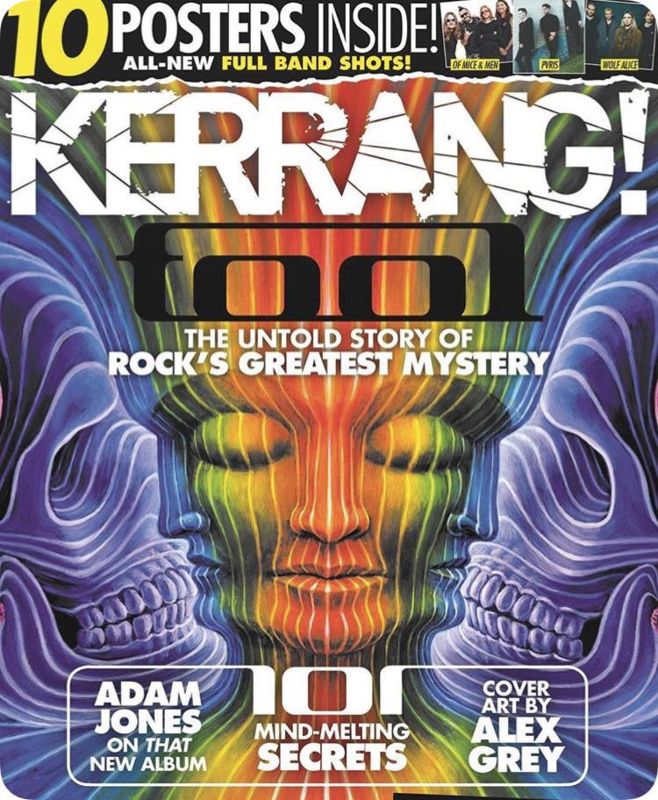 This update will include Tool related stuff, relevant side projects, and even a few updates from bands that have supported Tool, or I feel would generally interest Fourtheye readers. Got anything that might interest Fourtheye readers? Let me know! Adam posted on Instagram a pic of Justin with his new Warwick bass. Maynard is featuring in a number of short episodes recorded for the Revolver website, in which he discusses a range of topics – mostly about what inspires him to make music and wine. Don’t forget they have a newish album A Walk with Love & Death (which isn’t bad). And Dale has a solo album called The Fickle Finger of Fate (which is better). Adam Jones from Tool recently had a chat with Kelli from the Orange County Register, in which he discussed a few things about the current tour and upcoming San Bernadino show. He suggests that they’re still working on the album (though doesn’t give any clues as to when it’ll be done), and that the coming San Bernadino show isn’t a festival! The interview is reasonably short, and worth a quick read. In the meantime, the summer tour seems to be going pretty well. I’ve held back reporting on it wanting to not spoil those who are seeing them later in the tour. it’s safe to say that it’s not what some boldly predicted it to be (ie. a month long album launch party) but there have been a couple of small surprises. For those that want to delve deeper into these spoilers they can check out this thread in our forum. Before everyone goes and get’s too excited, I’m not suggesting Tool are actually recording at the moment – there’s still no indication Maynard is done with his bits yet, and personally don’t expect to see the band record in earnest until sometime after the tour. Still, it’s encouraging to see more coming out of the Tool camp, and I think the somewhat positive vibe I’m getting indicates there might be some good progress happening here. We’ll see! Maynard finally in Tool songwriting mode? 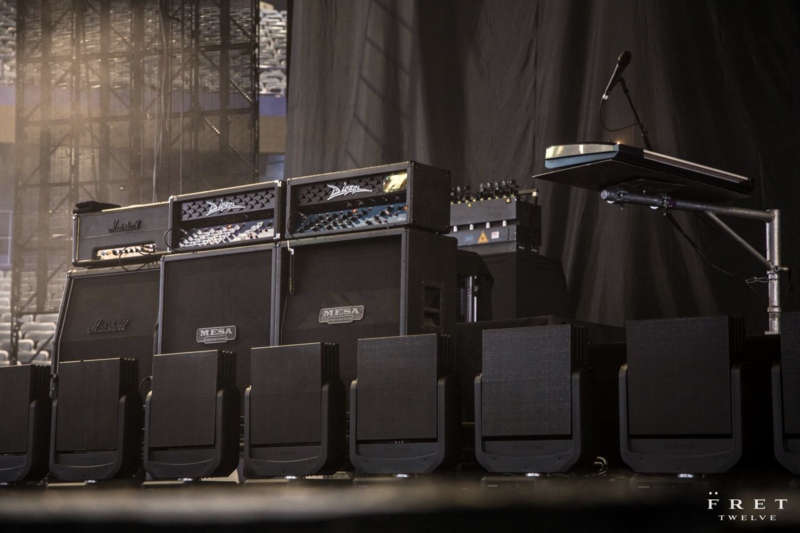 In speaking with Danny last night, he told me that the band has temporarily MOVED some of their gear into a larger space (across town) where MAYNARD is working on VOCALS for some of the new Tool material. I’m sure that he has already been doing this to some extent, but now he has more room to breathe and a better vocal booth. So good news it seems, and while I still think the album is some way off, it’s good to see some of the roadblocks being removed. Adam recently posted a snippet of some footage from this not-Loft location, showing mixing desks and other recording related gizmos. While I don’t think this is necessarily related Tool actually recording anything other than demos, it’s all good signs of progress. Adam confirms another track done! Progress is slow, however some glimmer of light shines through the storm clouds with Adam today confirming that another Tool track is “in the can (minus Vox)”. So while the album ain’t done yet (and probably is still a way off) at least there seems to be progress! Well, mainly Korin anyway. 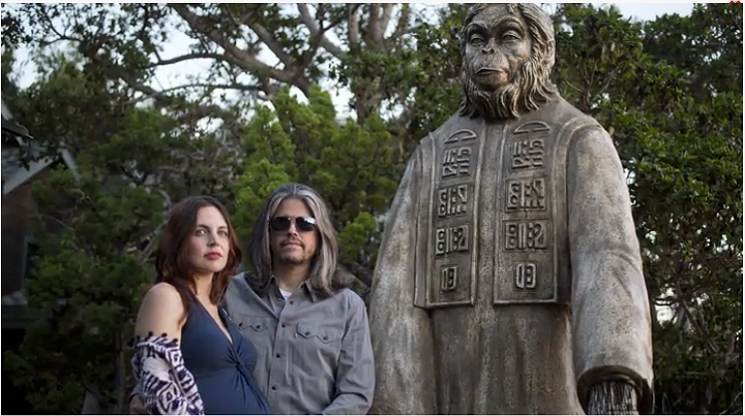 The following article has some small insight into the lifestyles of the rich and famous in Malibu, as well as revealing the large Planet of the Apes statue in their backyard. Enjoy! And in case you didn’t know, Korin gave birth to a second boy just days ago! Nice work Adam and Korin! The walls of their home are covered with paintings and framed comic book art. Three Grammy Awards sit on the mantle, and the toys of their young son are scattered everywhere. On the back patio stands a giant statue of the Ape Lawgiver from the original Planet of the Apes films. The good new is that Blair also commented on the problem, and suggested that Danny is already feeling better, so here’s hoping the rest of the tour goes as planned! BMB: In speaking with Danny tonight, he is feeling better (happy for a Chief’s victory), following the doctor’s orders the best that he can, and NOT ruling out a venomous spider bite. Even though the doctors’ who worked on his leg on Friday thought it would be better if he didn’t play the show, Danny insisted on performing. As always – a real trouper, Tool fans! I had planned for this month’s newsletter to be about a new course offered by select colleges and universities that will certainly be of interest to many Tool enthusiasts. The class is entitled, “Introduction, Production & Interpretation of Music Videos By Tool”, and is described in the curriculum guide as being an accelerated course about the band’s critically acclaimed video concepts. Now, I’m not trying to be anyone’s academic adviser – no, not this underachiever, who barely graduated from Miskatonic U. (go Black Goats!) – but just wanted to mention the prescribed requirements, credit hours, and enrollment details. I was also going to include a short interview with Adam Jones about his feelings on the new course, and whether or not he was going to participate in any way, such as classroom lectures or demonstrations of the video process via Google Hangouts tutorials, etc.? However, just as I was about to start typing, my attention was directed to some unread Tool email that urgently needed to be addressed. One of the messages had the subject heading of “Free Advertising”, while another read, “Tool and Mickey D’s.” All were from Tool fans letting me know about something that they noticed while eating at McDonald’s. This was an advertising photo on their tray liner that depicted a happy “I’m Lovin It” family of four with the father wearing a classic TOOL tee shirt. (Note: The shirt is called, “Phurba” and depicts a stylized Buddhist ritual implement, although, in the spirit of McZen – what with golden arches, Happy Meals and such – I don’t think any Buddhist monks will get too upset in being associated with what’s on the McDonald’s menu.) The link below will take you to a photo of the tray liner that was posted on the reddit website. As to my reply: I honestly didn’t know anything about the ‘Tool’ tray liner (After all, there’s an Inn ‘N Out close to where I live), and don’t know if anyone associated with the band is aware of it, or, for that matter, if they even give a McShit? No, I didn’t know about the Mickey D’s thing, but, unless someone close to the band is pulling my leg, I did hear that another fast food chain – whatchamacallit – has purposed selling a special Danny Carey drumstick. Let me think… It isn’t Chick-Fil-A (of course! ), and not Churchs Chicken either. Nor is it Popeyes, Roscoes, Pudgies, Chesters, Jollibee or Henny Penny. Oh, yeah – it’s Kentucky Fried Chicken (better known today as KFC, so as to keep your mind off of things like frying oil and trans fat). Again, if someone’s not yanking my chain, the D.C. signature drumsticks are going to be died purple (! ), and imprinted with a fake grill mark in the form of a ‘charred’ unicursal hexagram. Evidently, KFC’s “World’s Largest Logo” advertising stunt – the gigantic visage of Colonel Cluck, himself, laid out in colorful tiles on the desert floor near Area 51, where it can be seen from outer space in satellite imagery – didn’t quite live up to the company’s expectations, and now they are looking for something even cooler. Cheese and crackers! Look at the clock. In keeping with my new policy of spending no more than 30 minutes on each newsletter (as long as I’m being paid in mcnuggets), my time is up. I don’t imagine there really is a Tool course happening, but Blair could be hinting at either the contents of a new video (perhaps featuring Opiate) or maybe the content of the VIP sessions on the upcoming tour.